HomeBlogInsulation: Learning The BasicsWhat Is Spray Foam Insulation? Spray foam insulation is your all-in-one solution for air tightness, moisture and vapour control, energy efficiency and a host of other building envelope issues. Although more expensive than the fiberglass product, it has proven to outperform traditional materials in every way. That is why it has quickly become the preferred insulation system for architects, builders and homeowners in Ontario. 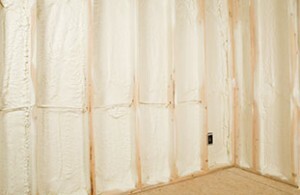 Spray foam insulation is a heat-activated polymer made from two different chemicals. It is sprayed through a heated hose which mixes the two. The mixture foams up and expands on contact providing a continuous air barrier on walls, flooring, ceilings, the roof cavity and any space that might need insulation. The foam hardens rapidly and lasts forever. You will never have to replace it. It is typically available as open cell spray foam or closed-cell spray foam. The experienced technicians at Platinum Spray Foam can explain the difference between the two types as well as help you select the best option for your home or commercial building. Whether you are retrofitting a home or insulating a new building, spray foam offers a great way to make your space more energy efficient and comfortable. Here are some of the main benefits that have caught the attention of property developers, owners and managers. Spray foam insulation must be installed by approved technicians to ensure its effectiveness and for you to enjoy the returns it was designed for. The brand you install also plays a significant role in the protection and benefits you will receive. Platinum Spray Foam only works with the best quality products from trusted manufacturers. BASF Walltite Eco, our spray foam insulation system of choice has many proven benefits. Installed by manufacturer-trained technicians, you can look forward to significant energy savings and a higher level of comfort. To learn more about the BASF Walltite Eco insulation system, call Platinum Spray Foam at (416) 731-8600 or request an estimate online.